I blogged about starting this project here and then a bit more progress here. Heather & Liam met at school for architecture, so I was happy to use that as a starting point for my fabric & even the design choice. Star-y represented nature & woodsy aspects and Log Cabin represented the city and buildings. It seemed pretty perfect to me, exactly how I think of Heather & Liam. 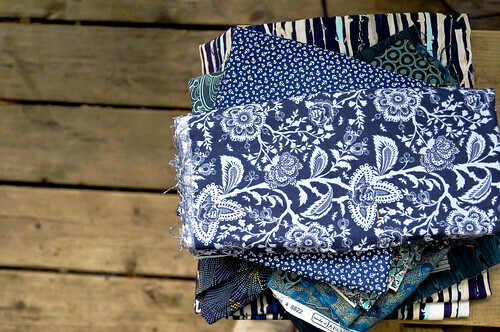 Working on a project for so long, I was able to keep adding new fabrics to the mix from my original selection. I tried to keep the navy’s very dark, almost black. I wanted to really have a lot of contrast within the design, something I’m not known for. There are only four blocks in this quilt, but they are quite large. 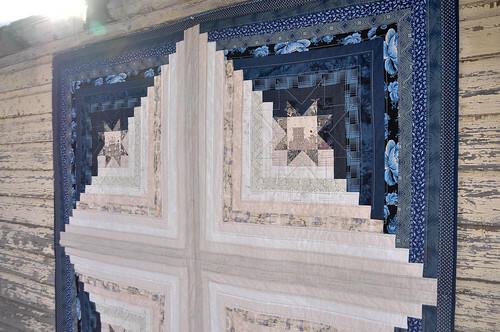 Each block is about 35″ square and the finished quilt is around 70″ square. A good size to snuggle under on the couch together, I hope. 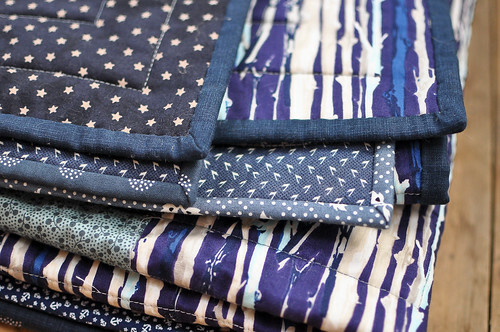 The star centres are my all time favourite fabric called City Limits. The top two stars feature the building tops, including a water tower. The bottom stars feature the brownstone stoops and streetview. 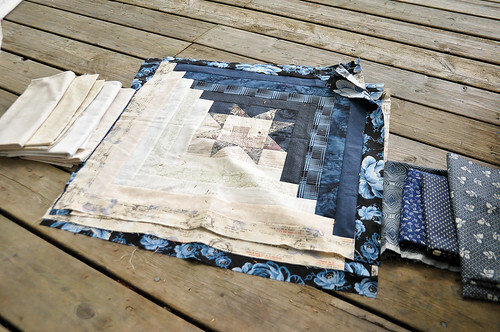 Working around the log cabin, I mixed in my favourite Japanese text prints and textures. For the back of the quilt, I used a large piece of Martha Negley’s navy forest fabric along with a dark navy star fabric. The back is like a star-y night in the woods to me. I paper pieced their initials into the back and hand embroidered the year and my name. My new goal is to work the label into the quilt before it gets basted. This way when I finish sewing the binding, the quilt is complete. This is a lesson learned from the 3 complete gift quilts I have on a shelf that are just waiting on labels! 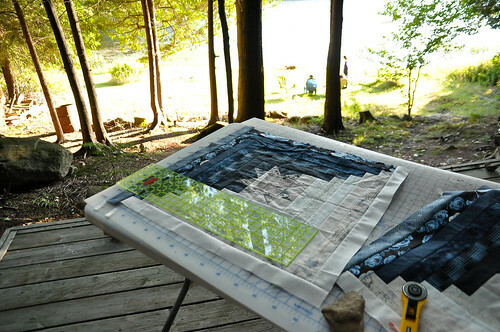 I machine quilted the whole quilt in two long nights. Nothing complicated, just in the ditch around the stars and then an echo around the stars. After that I just echoed the logs in concentric squares. For the binding I chose to do a scrappy look, so I could add in a few more fabrics that I loved but hadn’t fit into the main part of the quilt. A mini anchor fabric especially needed to make an appearance. Since I was so pressed for time at the end I really considered machine sewing the binding in full, but I couldn’t bring myself to do it. The final hand stitching of the binding is something that really completes the project for me and I love getting to spend those last hours underneath the quilt. But a quilt binding can often take me DAYS to finish and I had one night. Luckily I consulted with Amanda who recommended using Audible.com and getting an audio book. This saved my life!! I have never hand stitched binding so quickly in my life. All together it took about four hours, not even a full book to get the binding done. 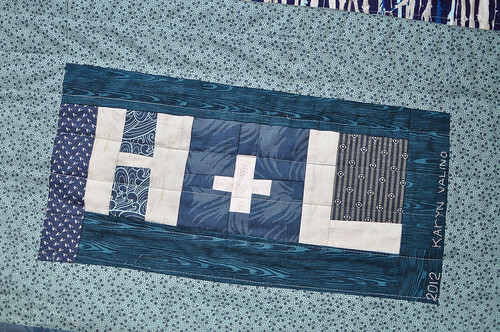 The quilt went home with Heather & Liam the other day. I’m not going to lie, it is my most favourite quilt I’ve made so far. I was especially inspired while making this quilt. Every decision and stitch reflected the two amazing people I was making it for which made this a truly vibrant piece. Yesterday I cut out pieces to make myself a little replica block, so I can have it as a mini quilt for myself. Happy New Year Karyn! That’s a fantastic quilt, congratulations!! 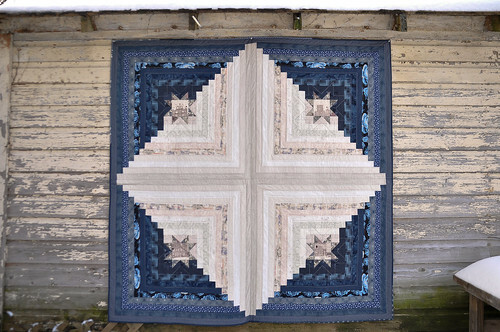 I cannot get over how much I like this quilt! The contrast is amazing, I love the shape-within-a-shape effect you achieved with the different halves of the log cabin. The recipients must be thrilled to have it. i LOVE this! so simple. 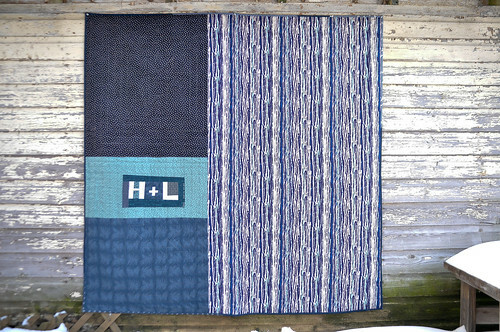 i’ve made very few traditional quilts but i’m thinking this is one i’ll have to try – using modern fabrics, of course. 🙂 great job! It is gorgeous, what a beautiful gift and a real joy to receive I’m sure. it’s SO beautiful! what a lovely gift! 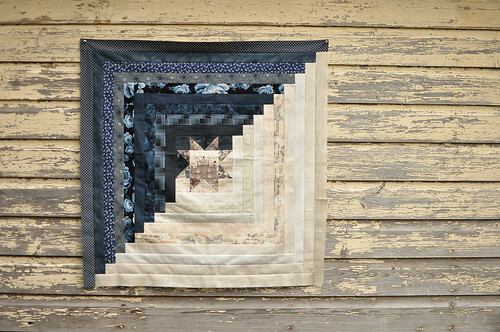 This quilt is so lovely and restrained. 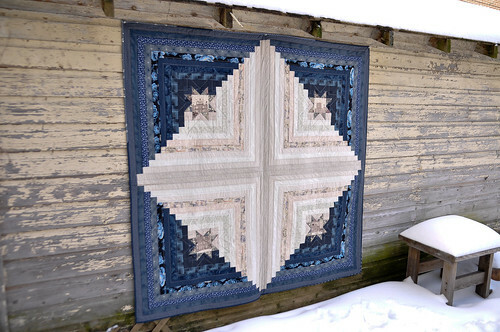 This quilt is soooo inspiring! I love the colour, love, love, love!